While daily flossing and brushing are essential to prevent tooth decay, dental sealants can also be very useful to help protect children’s teeth from decay. The sealant provides a strong barrier between the tooth and decay causing bacteria. 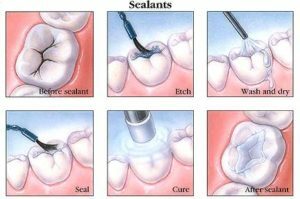 Sealants are made of a strong material that bonds directly to the teeth to protect them from food particles and plaque. It ensures the bacteria doesn’t get into the tiny crevasses in children’s teeth where cavities could potentially form. This quick and effective treatment can be done in just one visit. First the area is thoroughly cleaned and an etchant is applied to roughen the tooth’s surface allowing the sealant to bond properly. The sealant is then applied to the surface of the tooth and fills any small pits or fissures that would be prone to decay. Finally, the sealant is cured with a special light. Children’s teeth are much more susceptible to decay than adult teeth and applying a sealant could greatly improve the odds of resisting tooth decay and avoiding potential cavities. Additionally, permanent teeth are also more susceptible to decay when they first erupt and the sealant can help protect them during these formative years. Sealants can last for many years and would be re-examined during each subsequent visit following treatment to see if it needs to be re-applied. Book an appointment to examine your child’s teeth to see if they would need sealant treatment. Dr. Liu can examine your child’s teeth to see if they would be a good candidate for sealant treatment.